This is, by far, the tallest thing that has ever come out of my kitchen. It was tall, people. Like over a foot tall. But that’s enough about the height of the cake. It was also delicious! 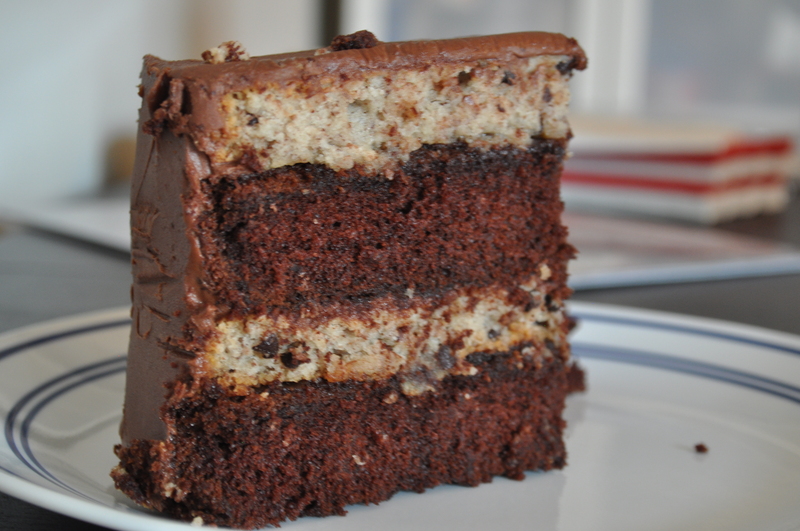 Two layers of chocolate orange cake, with chocolate chip french macaron layers to fill in. Pretty amazing. The taste was as good as the cake was high. Yep, tall. This cake was actually another product of my sister’s birthday. Sure, her birthday used to be a an occassion where she just got to pick her own dessert. But it’s turned into a challenge for me to outdo whatever I created the year before. And if last year’s was a monster, then this year’s was a beast. If you consider beasts to be bigger than monsters, that is. But there is much more to this story than this: we had a party for my sister’s birthday. A Michael Jackson themed party. Alas, there was no time to take beautiful photos to show just how scrumptious this cake was between the karaoke and the moonwalking! So you don’t even get to see the true tallness of this cake! I know, such a tease. 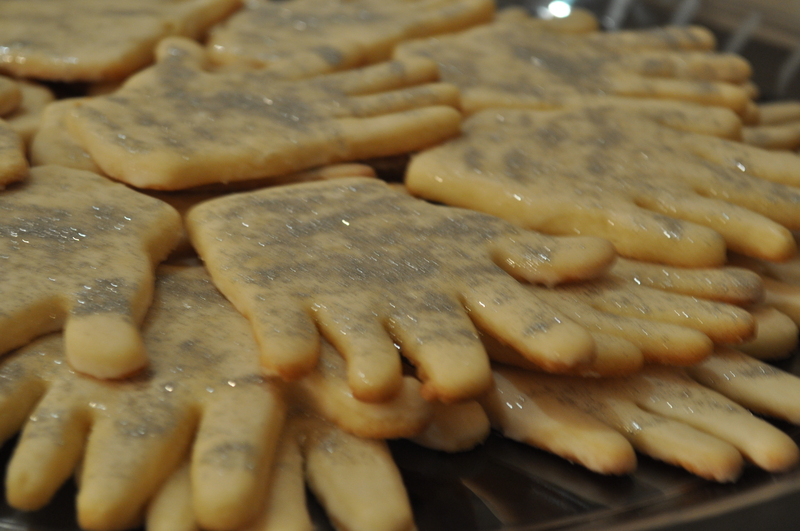 But you will see the Thriller glove sugar cookies that I made. And I certainly hope that makes up for it. Considering how impressive this cake looks, it was surprisingly easy to put together. It was frosted, and ready to be eaten all in a morning’s time. I love the chocolate orange combo, and so does my sister (and so does Michael Jackson, we’d like to believe), but the fruit/chocolate combo is obviously endless. Or you can make it pure chocolate. I have to say that the chocolate was a bit too much for me (but I’m a cinnamon and fruit flavored dessert girl, after all), so next time I would probably omit the chocolate chips from the macaron layers. The aforementioned tall thing is pretty important considering serving sizes – with this four layer cake, we were able to feed about 40 people with satisfying slices. Preheat oven to 350 degrees. Butter two 9 inch round cake pans. Line with parchment paper and butter the parchment paper. 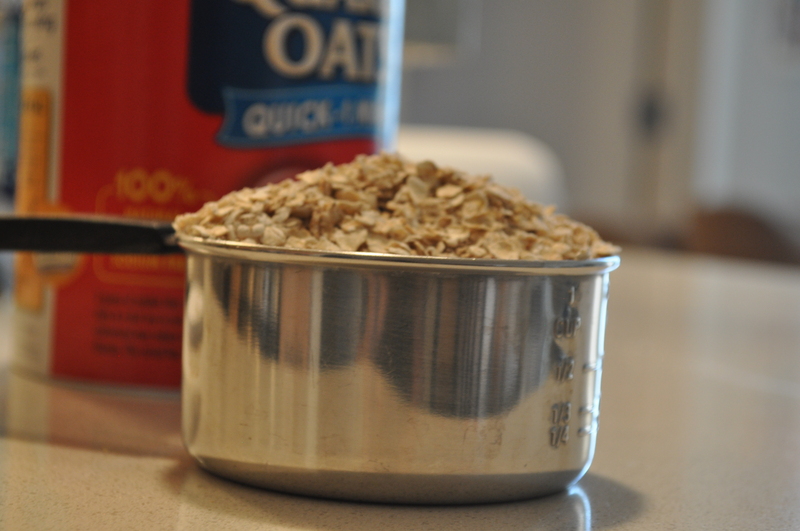 In a bowl of a standing mixer, combine all dry ingredients, through the salt. Mix on low speed for about 30 seconds until everything is well combined. Add butter and buttermilk and blend, starting on low speed, increasing as it starts to become well combined. Beat for 2-3 minutes. In a separate bowl, whisk together the eggs, coffee, vanilla and orange zest. With the mixer running, blend in the coffee mixture in 3 additions. When well blended, take a spatula and stir, scraping the bottom, ensuring that all of the dry ingredients have been thoroughly mixed in. Divide the batter evenly between the two pans. Bake for 40 minutes, or until a tester comes out clean. Let cool on a wire rack, in their pans until cool enough to handle, then turn out of pans and let the layers cool completely on the wire rack. Set the oven racks in the top third and bottom third of oven. Preheat the oven to 325. Spray two 9 inch cake pans with cooking spray. Line with parchment paper, and spray again. Set aside. In a bowl, mix together the almonds, sugar and salt. With a mixer, whip egg whites until soft peaks form. With the mixer running, slowly add in the vanilla and remaining 3 tablespoons of sugar. 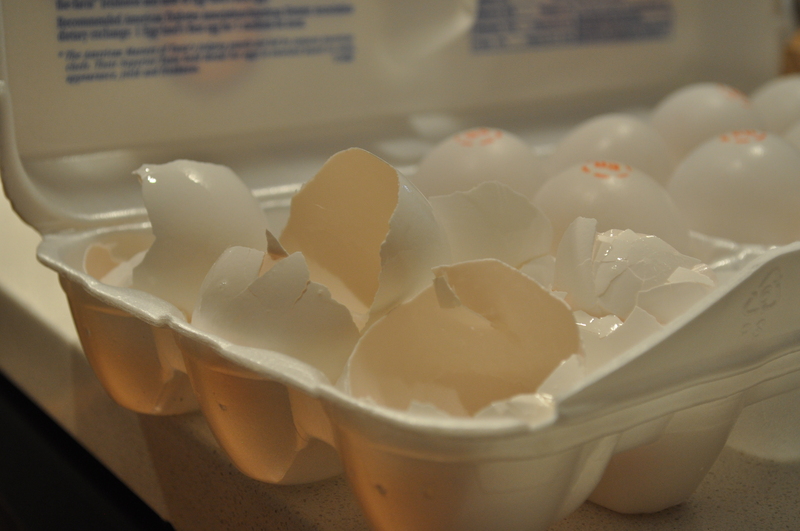 Beat until the egg whites are stiff but not dry. Gently fold in the egg white mixture into the almond mixture until well combined. Add mini chocolate chips and stir. 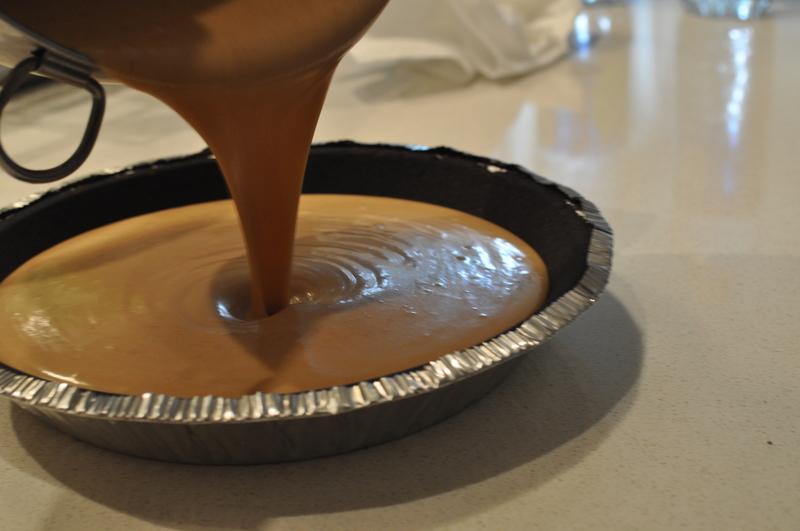 Divide evenly among the two pans, spreading to make sure that it covers all sides. Bake macaron layers until golden and almost firm to the touch, rotating the pans half way through the baking. Bake for 40 minutes. Take out of oven and let cool, in the pan, on a wire rack until cool enough to handle. Carefully take the layers out of the pans and let cool completely on a wire rack. Place everything in a blender and blend until well combined. Add more half and half if needed for a better consistency. 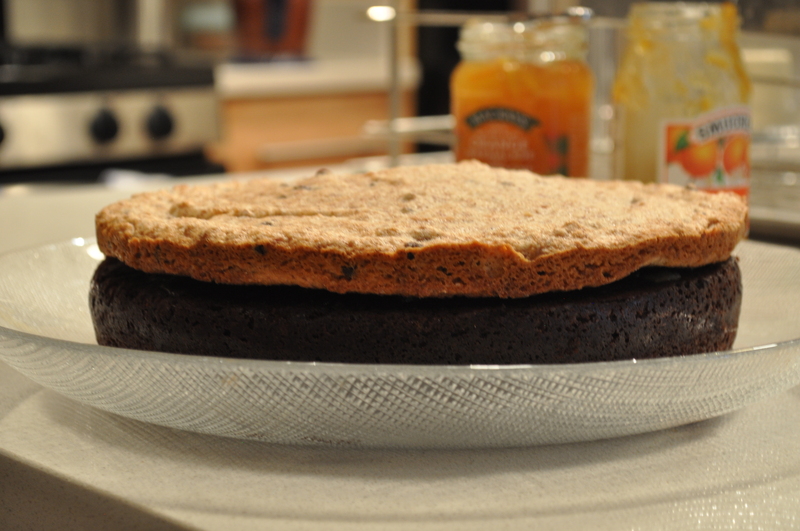 On a plate, place a chocolate cake layer upside down. Spread with about 2 tablespoons of orange marmalade, or enough to cover the surface of the cake. Place a macaron layer on top of the marmalade. Spread a layer of the chocolate frosting on top. 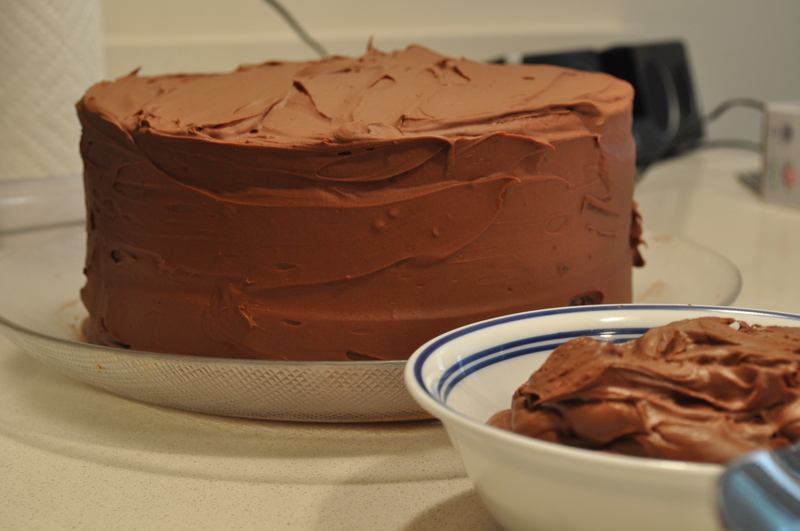 Place another layer of the chocolate cake layer on top of the frosting. Spread more orange marmalade on the cake layer. Repeat with macaron layer. Place the remainder of the frosting on top, covering the top and sides. Place in the refrigerator until ready to eat. Do you remember when I really didn’t like zucchini? How I didn’t like it in any shape or form ever. I tried to develop a taste for it, but it never really did anything for me. Until I went to Italy this summer. The Italians really know how to cook! Bet you didn’t know that. 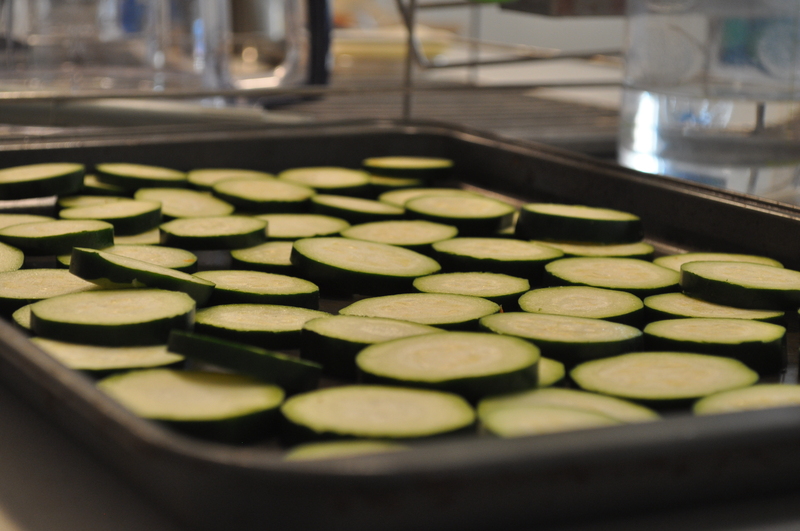 And they definitely know how to cook zucchini: it always ended up fresh, light and clean. Exactly how zucchini should be. I ended up completely making a 180 about zucchini. I started putting it in everything! Pastas, pizzas, salads, as a side – I used zucchini in everything that I did not like zucchini in before. This was a summer of transformation for me. I like to call it the summer of zucchini love. 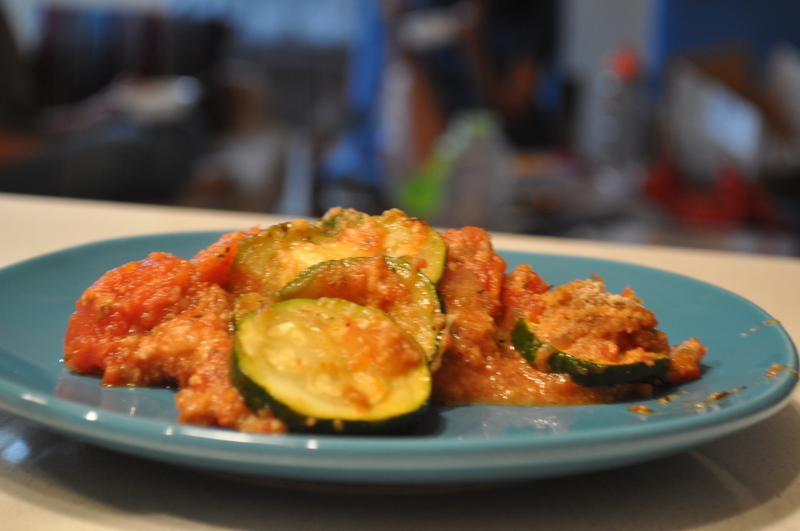 One of my favorite dishes that I had in Italy was a zucchini parmesan. It was absolutely delicious and totally unlike any parmesan dishes I had before. The zucchini was lightly sauteed, not fried, and just sprinkled with breadcrumbs and the best fresh cheese ever (the Italians make good cheese too!). It was all brought together by this thick tomato sauce that was out of this world. I tried to recreate it, and it was quite tasty. But I’d advise you to take a trip to Italy so you can try the original version. And then you can experience your own zucchini love. Preheat oven to 450. Oil two baking sheets with olive oil. Slice the zucchini about 1/2 inch thick and place onto prepared baking sheet. Season with salt and pepper. Bake until the slices turn golden brown, about 8 minutes. Let cool. Reduce the oven temperature to 350. 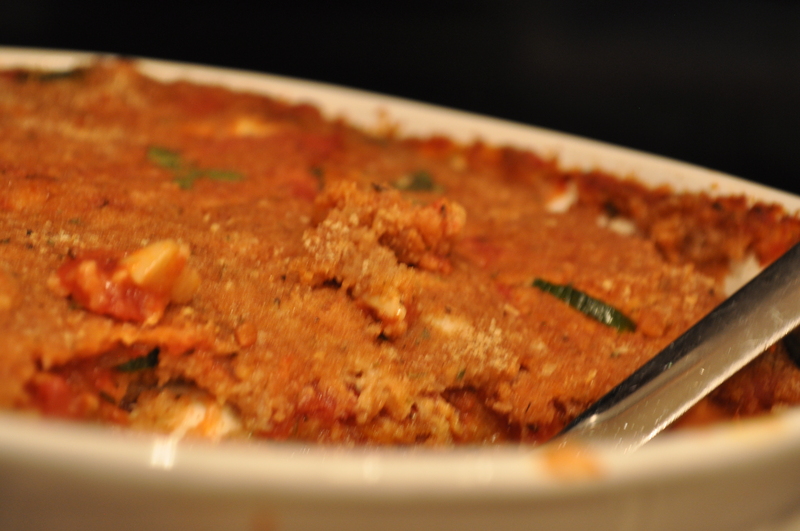 In a casserole dish, spoon 1/4 cup tomato sauce. Layer the zucchini on top. 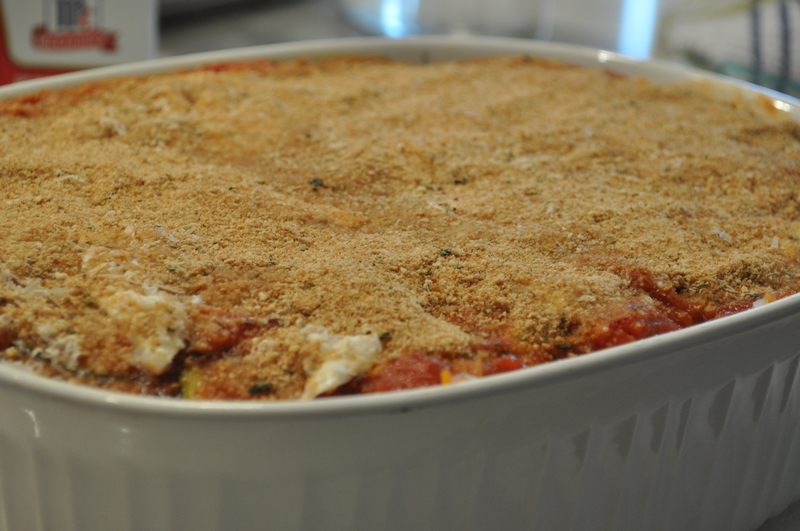 Sprinkle with 1/4 of the basil leaves, 1/4 of the parmesan, slices of mozzarella and 1/4 cup of breadcrumbs. Keep covering by layering until all of the ingredients have been used. Bake for 20 minutes until bubbly and golden brown. Let cool slightly and serve. I entered a no-bake cookie contest. At a state fair. Not even my own state’s state fair! Just a random no bake cookie contest at a random state fair. And, people, I was positive that I was going to win. Not only that, I just knew that I was going to get first place. There wasn’t a doubt in my mind. Well, I didn’t get first place. Or second, or third. In fact, I spotted my cookies on the fair secretary’s lunch plate while judging was still going on. So, no, I’m not going to post the losing cookie recipe. Even though it sure was tasty and should have been a winner. What I didn’t enter (but should have) was this cookie right here. 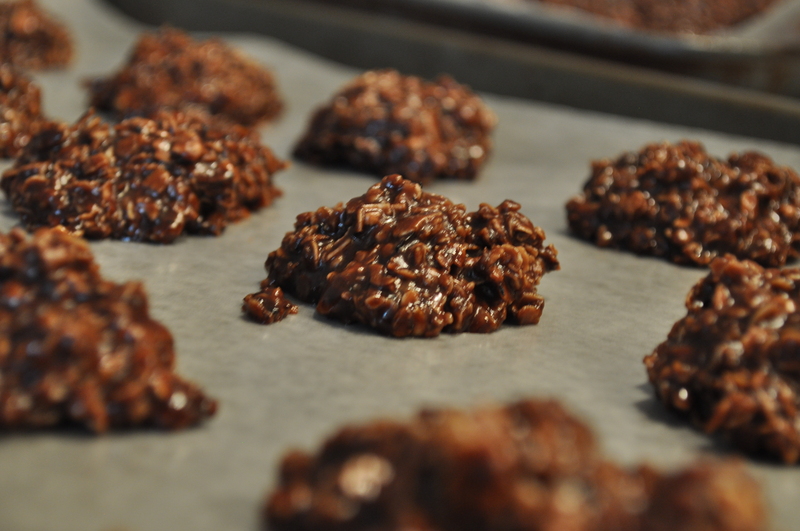 A recipe that comes up about 4 million times (exaggeration) when you google “no bake cookie”. It’s apparently very much the ultimate no bake cookie. I tried this recipe before the contest to test it out, and thought it tasted way too gooey and sweet – more like candy instead of cookie. Also, because it was so well known, I decided that there is no way that this recipe would win. I needed something more cookie-like and unique. Well, lo and behold, when I dropped off the cookies to the judging table, there were about 17 cookies that looked just like these. Not too surprising. But then, I find out that these won first place. What?! How does this even work? How do cookies that show up 4 million times through google, and 17 times at one competition and don’t even taste like cookies win first place at a cookie contest?! No answers. None at all. But at least I can say that I’m posting a winning recipe! I sound bitter. So here I am saying that these are quite tasty! But like I said, these don’t really taste like cookies. In fact, I was contemplating calling them “oatmeal chocolate nut fudge drops”, but that didn’t roll off the tongue as easily. 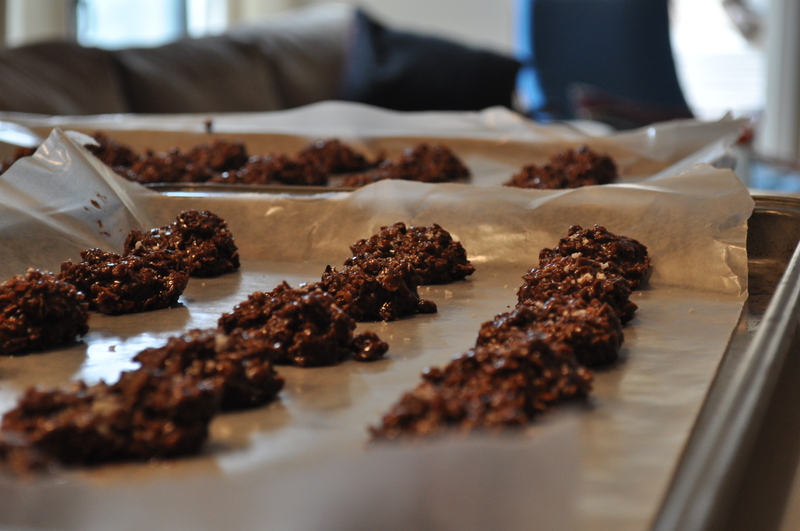 I did change the recipe a bit to add a crunch factor that is more reminiscent of cookies. I also added salt, which was not in any of the recipes that I saw. And let’s be honest, these are ridiculously easy, which ups their appeal factor. These are best out of the refrigerator. In a saucepan, over medium heat, stir together the butter, cocoa, milk and sugar. Bring to a boil and let it boil for 1 minute. 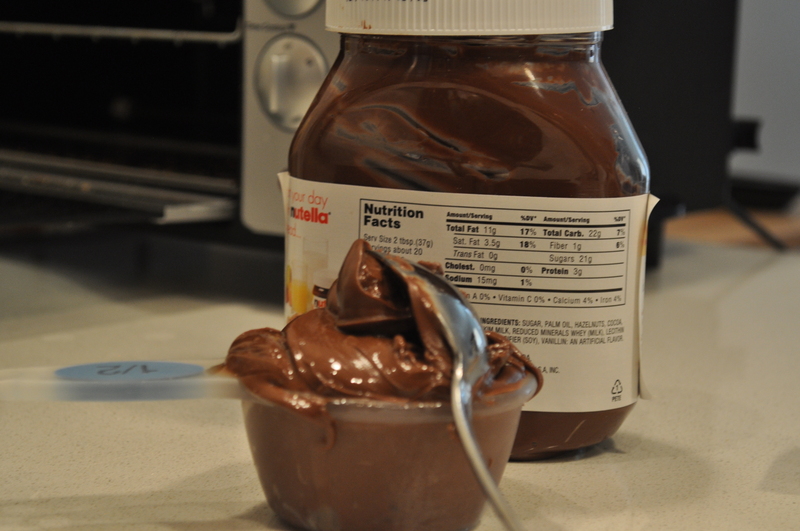 Take it off the heat and add Nutella, and vanilla. 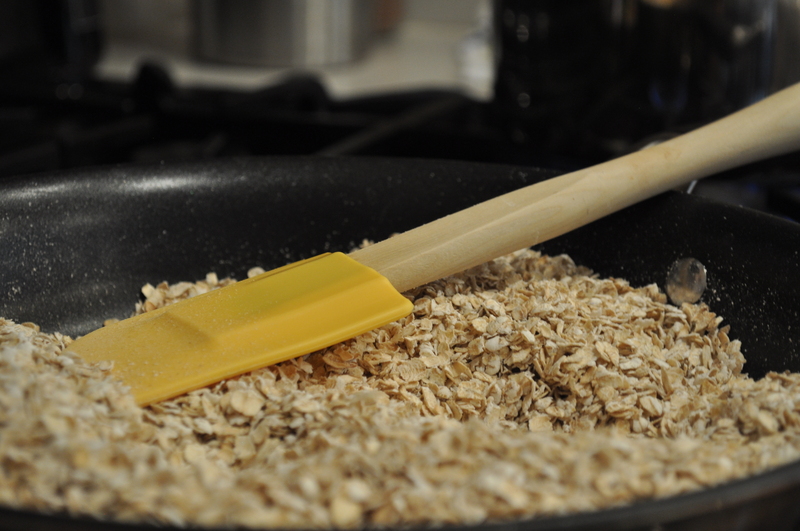 After it is all well mixed together, stir in oats, salt, and nuts. Drop by tablespoon-fulls on baking sheets, lined with waxed paper. Let it set and form into cookie like shapes. Store in the refrigerator. I’ve loved froyo forever. Long before it was the trendiest treat in town. I loved it before the tangy’s and the sweet’s. Before the pink’s and the berry’s. I even loved it when it was still called frozen yogurt. I’m not going to lie – I claim froyo to be mine. Needless to say, there have been a countless number of times when I have tried to make froyo at home. And alas, there have been a subsequent countless number of failures. Turns out that froyo is not the easiest thing to make. I’ve tried to freeze yogurt that I’ve bought. I’ve tried to make my own yogurt (not so smart). I even bought a machine that’s specifically for making froyo. Nothing worked. And then I realized that froyo is just a lighter version of ice cream! So, of course, there has to be churning involved! Or, in this case, blending. This is by far the easiest recipe of frozen yogurt that I’ve come across, and also the tastiest. 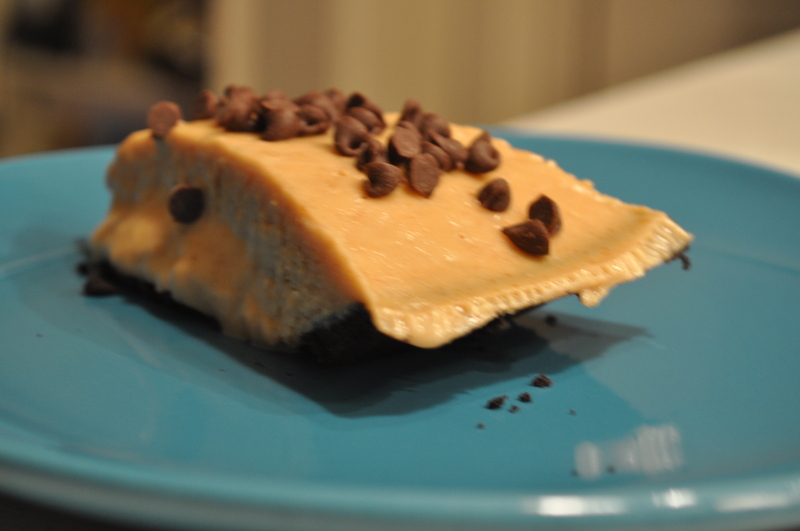 I poured mine into a pie shell to have one last summer-hurrah frozen dessert. But I’m thinking that this would be quite comforting in the cold weather as well. And if you make this enough, I’ll even let you claim froyo for yourself. You’re welcome. 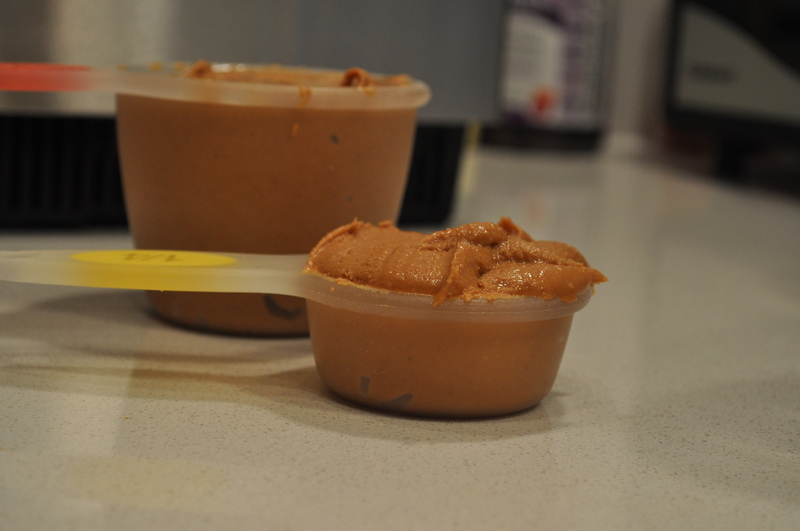 Blend together yogurt, peanut butter, milk and agave until completely smooth, about 2 minutes. Let chill and firm up in the refrigerator for about 2 hours. 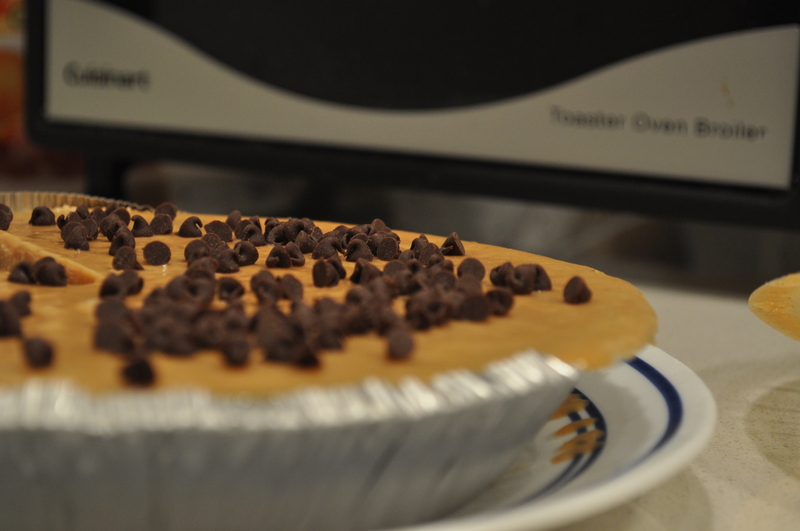 Mix in the mini chocolate chips, and pour mixture into the ready pie crust. 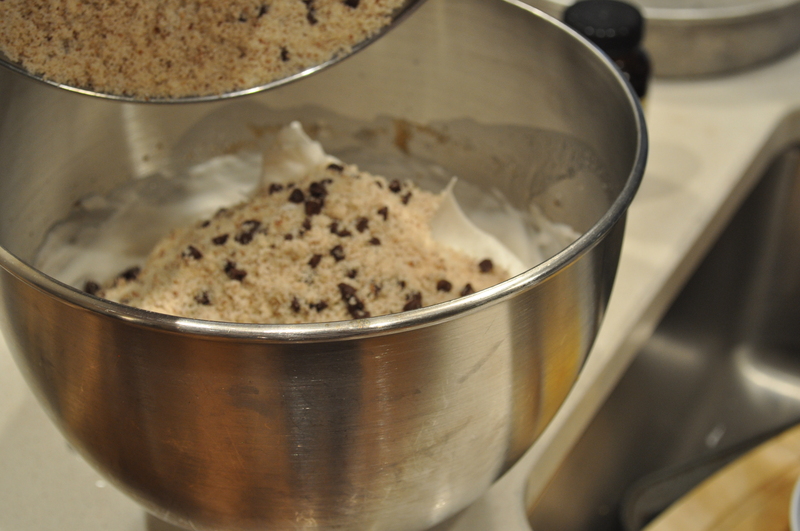 Sprinkle additional chocolate chips on top. Place into the freezer until firm, about 2 hours.